Holiday Gift Ideas - A Little Something For Everyone! Gift giving isn't always easy, and finding the perfect present can be tough. As a matter of fact, figuring out what YOU want for a gift can be tough as well. Check out the lists below for some great ideas that anyone is sure to love (even you)! 1. Hamilton Beach Set and Forget 6-Quart Slow Cooker - Clip tight gasket lid reduces messy spills while full grip handles allow you to transport heavy meals easily, and thermometer probe displays the meat temperature as it cooks. 2. Paderno World Cuisine Tri-Blade Plastic Spiral Vegetable Slicer - Make quick work of fancy vegetable peeling and turn tons of different vegetables into healthy noodles. 4. Misto Gourmet Olive Oil Sprayer (Set of 2) - Add your favorite oil, vinegar, juice, etc. Great for spraying on vegetables, salads, and meats! 5. I'd Be A Vegetarian If Bacon Grew On Trees Funny Apron - Classic bib apron, perfect for any bacon lover! 6. Cuisinart CGS-5014 14-Piece Deluxe Stainless-Steel Grill Set - Includes chef's spatula, grill tongs, silicone basting brush, 4 pairs of corn holders, cleaning brush, extra brush head and storage case. 7. Cuisinart Smart Stick 2-Speed Immersion Hand Blender with Attachments - An immersion blender is usually one of those gifts that everyone wants but never gets around to buying. They are handy for making soup and sauces and all sorts of other things. 8. Cuisinart Pro Classic 7-Cup Food Processor - A good food processor is another gift that most cooks would love to have but never get around to buying for themselves. Give one of these and you are sure to impress! 8. Blendtec Home The Professional's Choice Total Blender - This is the Holy Grail of all blenders, and is sure to score you HUGE points if it winds up under a Christmas tree. Every cook wants an amazing blender, and this one is the top of the line. 1. 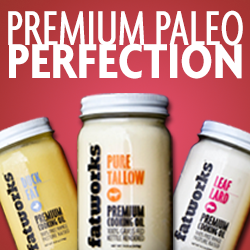 The Paleo Solution - Robb Wolf gives you the low-down on the science behind the paleo lifestyle and also has a four-week menu and a bunch of great recipes to try out. 3. Against All Grain: Delectable Paleo Recipes To Eat Well & Feel Great - Danielle Walker recreates all of her favorites recipes but without grains, gluten or dairy. Check out the reviews and you will see why gifting this book is a no-brainer! 4. Nom Nom Paleo: Food For Humans - This book is a must have for anyone living a paleo lifestyle. Michelle Tam is one of the best known bloggers in the paleo world and her amazing recipes are not to be missed. 1. Under Armour Medium Duffel - Perfect for the gym or for any sports player, this bag features tons of room for your gear, mesh ventilation for breathability, and an adjustable, padded shoulder strap. 2. Cap Barbell Kettlebell - A kettlebell is a great item to have at home for when you don't have time to make it to the gym. 3. Black Mountain Products Resistance Band Set - Resistance bands are a great way to add variety to your strength training routine and make a great gift for a traveler or someone who likes to work out at home. 4. Gaiam Print Premium Yoga Mats - A fun, trendy new yoga mat is a great gift for any yoga enthusiast. They also make great mats for stretching or floor exercises. Mat totes are also a great gift idea. 5. Omron HJ-112 Pocket Pedometer - Pedometers make exercise fun because you can try and beat your own record every day. Better yet, buy two and have a contest between yourself and a friend or significant other to see who can get the highest score each day! 6. Nathan Trek Angled Holster Hydration Waist Pack - Lugging around a water bottle, car keys and a phone can be a pain for any who enjoys the outdoors, but this pack allows you carry everything hands-free, and it comes in purple or black. 1. Fred & Friends Ms Food Face Plate - These "food face" plates are a great way to get picky eaters to enjoy food they might normally stick their nose up at. Fruits and vegetables are a lot more fun when they are in the shape of a wacky hairstyle or funny mustache! 2. The Little Cook 7-piece Apron and Bakeware Set - Everyone knows the right outfit is essential! Make cooking more fun for your kids by letting them dress like a real chef, complete with chef hat, apron and oven mitts, along with some baking gear! 3. Curious Chef Kids 6-Piece Fruit and Veggie Prep Kit- Getting your kids involved in cooking and food preparation is a great way to get them interested in trying new foods. Kids are proud to show off the foods they made and are more likely to eat new things if they were the ones to cook it! Get them eating healthy with this amazing fruit and veggie prep kit! 1. Level Naturals Bath Bombs: Mixed 6-pk - Bath bombs are a great way to help you relax after a long day. These are made with essential oils and organic ingredients and are non-gmo. 2. Organics To Go - A kit with all of the best Daily Essentials products to help you achieve an organically radiant glow. A complete system for all skin types that is great for travel, your gym bag or anywhere on the go. 3. Himalaya Herbal Healthcare Nourishing Face Moisturizing Lotion - The main ingredients for this face moisturizer are natural oils, but is lightweight and not greasy feeling at all, so it is great for all skin types.